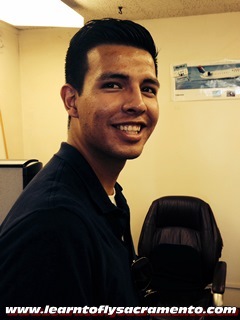 Congratulations To Nestor Cisneros – First Solo | Executive Flyers, Inc.
Today Executive Flyers, Inc. congratulates Nestor Cisneros on executing his first solo flight! This will be a day Nestor will remember forever as the first solo is a huge accomplishment. Nestor, formerly of Los Angeles, is training to get his private pilot licenses and the first solo is not only an important step in this process, but also helps build a student pilots confidence! You can see in the picture that Nestor is one happy student pilot! Nothing beats the feeling of going up the first time solo. Keep up the great work Nestor!